Last Thursday, about 40 people came out to a lively town hall about raising the minimum wage! 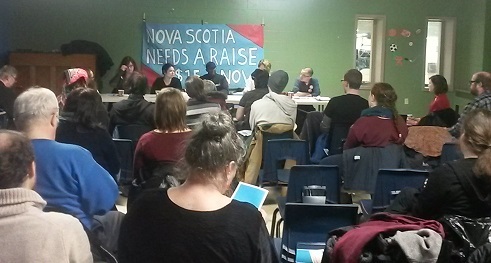 We heard from a panel of speakers including workers, students, researchers, and activists – all talking about the need for a living wage here in Nova Scotia! Darryl King, a board member of Nova Scotia ACORN, spoke about the difficulties of living on minimum wage and the importance of bringing people together to fight for change! The living wage campaign will the theme of this year’s upcoming May Day demonstration. The first of May is celebrated as International Workers’ Day and commemorates the lives of workers who fought and died for the 8 hour work day. This event was organized in coalition with Nova Scotia ACORN, the Canadian Federation of Students (CFS), the Halifax and Dartmouth District Labor Council (HDDLC) and Solidarity Halifax.